Family Summer Kick-off at Magazine Beach Friday, June 20! Join us Friday, June 20, 5-8pm, for live music, children’s games organized by Knucklebones. and art installations that you help create! Bring a picnic and enjoy the almost longest day of the year. 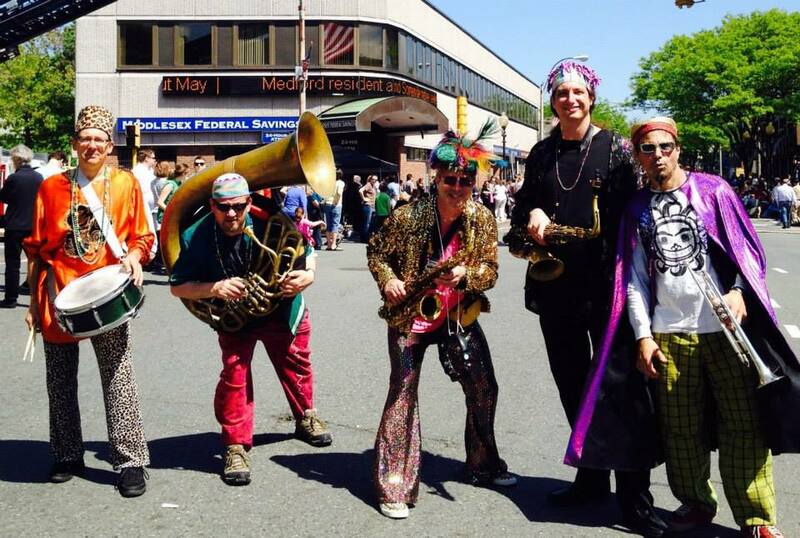 Music provided by the Revolutionary Snake Ensemble, a costumed funk & street beat improvisational brass band based in Cambridgeport. Food trucks, too! This will be the first of a whole series of FREE programs at Magazine Beach this summer. The Revolutionary Snake Ensemble, led by saxophonist Ken Field, performs a unique blend of original and traditional New Orleans Mardi Gras brass band music. The group’s colorful costumes and creative arrangements have delighted audiences from Maine to New Orleans, and this July they will be performing in Roswell, NM and Venice, Italy. Knucklebones will inspire athletics for all ages…for the love of play! Art Installations, that you can contribute to: Rising Tides by the Energy Necklace Project, looking forwards and making the invisible visible by showing future flood levels due to sea level rise, storm floods and climate change today, 2050, 2100. . Marking the Shoreline by Cambridgeport’s own Ross Miller, looking back, at the early 1800s shoreline of Captain’s Island. Yes, Magazine Beach was once an island! Organized by the Cambridgeport Neighborhood Association, Inc., with partners the Massachusetts Department of Conservation & Recreation, the Charles River Conservancy, Riverside Boat Club, Cambridge Arts and the Cambridge Historical Commission. Sponsored by Sanofi, Knucklebones and the Charles River Conservancy. Note: In case of rain, this event will be cancelled. If it’s looking cloudy the day of the event, check here for weather updates. Questions? Contact Cathie Zusy at cathzusy@gmail.com or 617-868-0489. Location: Magazine Beach Park is along Memorial Drive, between the BU Bridge and Riverside Boat Club, and across from Micro Center and Trader Joe’s. It is at the foot of Magazine Street; there is a pedestrian bridge there to cross over to the park. It is a 15-minute walk down Magazine Street from the Central Square MBTA stop. ← Full Program of Events at Magazine Beach Park this Summer!